I am currently on a quest to eat at every single restaurant inside Eataly. I’ve had all the desserts, espresso, meat and cheese in La Piazza; I’ve ordered take out pizza from Rossopomodoro and focaccia from the bakery; but now it’s time to try out the sit down restaurants and I decided to start at Il Pesce. Il Pesce is the seafood restaurant in Eataly and has a rotating list of daily specials as well as a nice open kitchen to watch all the cooking. 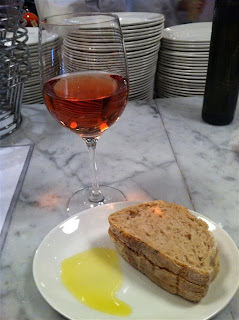 I got a seat at the bar and started out with a nice glass of the Bollicine Rose and some bread and oil. The specials that night didn’t excite me so I went for a regular menu option the Insalata di Mare (steamed seafood salad). When this bowl arrived I was shocked at how big it was. Mussels, Clams, Calamari and Octopus had all been steamed in a white wine broth and various other herbs. The Mussels and Clams were wonderful- I ate those right away. However the octopus became a bit much for me. There was just so much of it! I don’t know anyone who could eat that much in one sitting. I wish they had balanced the seafood a bit more but overall I did enjoy the broth. One of the best things about Il Pesce was the atmosphere. 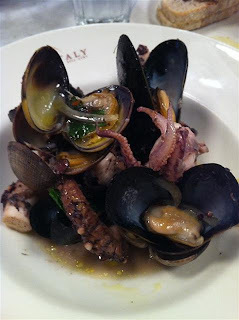 As a semi-regular single diner Il Pesce is a perfect place to eat. I could watch all of the excitement from La Piazza as I ate, the food came out within a matter of minutes and I never felt uncomfortable or out of place. Il Pesce is done, maybe Manzo will be next.